Some pretty big heavy-hitters were added to the box office roller derby this weekend. Yet the combined star wattage of Tom Cruise, Cameron Diaz, Adam Sandler, Chris Rock, and a bunch of unfunny, pot-bellied has-been comedians (Kevin James, David Spade, etc.) couldn’t dislodge our favorite toys from the top spot. The weekend box office showcased the best (and worst) of American popular taste. Read on for more analysis. ‘Toy Story 3‘ continues the unchallenged string of Disney/Pixar blockbusters. Staying atop the box office for the second week in a row, the masterful sequel took in another $59 million, for a total gross of a whopping $226 million so far. That’s a lot of dollars! It has almost eclipsed the domestic tally for DreamWorks Animation’s ‘Shrek Forever After’, and it’s only been out for two weeks. In comparison, the fourth ‘Shrek’ movie opened way back in May. ‘Toy Story 3’ is looking like the breakout box office hit of the season, unless Christopher Nolan’s ‘Inception’ proves that it can overcome its over-intellectualized eggheadishness and connect with everyday audiences to win big. I’m not saying that’s an impossibility, but it’s a big hurdle to overcome, no matter how many well-manicured stars like Leonardo DiCaprio appear. 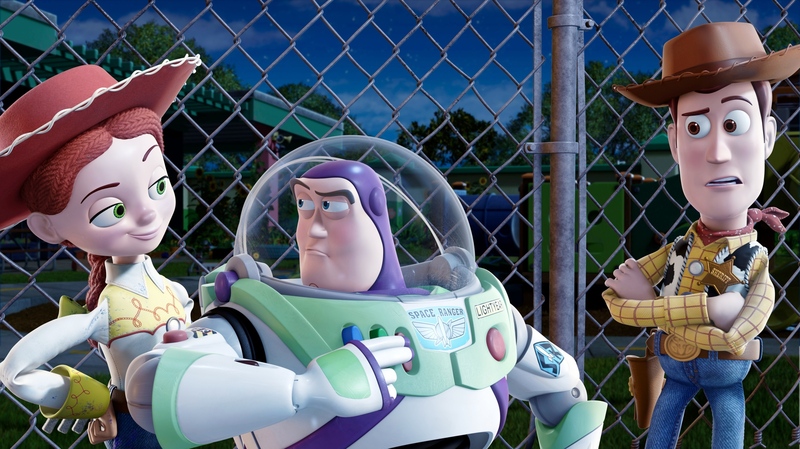 ‘Toy Story 3′ has three things going for it. First, it’s a family movie, so everyone can go see it. Two, the movie is in 3-D, which means that the extra charge for the glasses adds about $18 for every $100 million it actually earns. And Three, it’s a masterpiece. This means that people will be talking about how great it is and will recommend it to all their friends, even the ones who usually aren’t interested in 3-D animated kids’ movies. It really is that good. On the other end of the spectrum is the #2 movie, ‘Grown Ups.’ There’s been a lot of speculation online over the weekend that ‘Grown Ups’ is Adam Sandler’s knee-jerk reaction to the critical and commercial indifference of last summer’s ‘Funny People.’ He seems to be saying, “Well, if I can never please the critics, I’ll just do some dross that will actually make me some money.” And indeed it did. $41 million, to be exact. I haven’t talked to one non-critic who saw the movie, and I can’t imagine anyone wanting to see it. The poster had a bunch of fat middle aged men on a water slide, for crying out loud! How is that attractive to anyone? I’m pretty sure I would rather get water-boarded than watch this movie. But hey, it made dough. I’m sure it’ll be a while before we see Sandler branch out into riskier territory again like he did, brilliantly, with Paul Thomas Anderson’s ‘Punch-Drunk Love.’ It’s a real shame, too, because the dude can be good. When he’s not acting like a complete buffoon. Coming in third was the other big debut, James Mangold’s ‘Knight and Day.’ Besieged by production problems and behind-the-scenes doubts, the movie still managed a respectable $20.5 million over the weekend. Less impressive is its cumulative $27.7 tally, which is tabulated from the movie’s opening date last Wednesday. That’s not a great opening for the Tom Cruise / Cameron Diaz romantic actioner, but I really believe that this will carry strong word-of-mouth and could see an uptick later down the line. Also, it should perform even better overseas. I hope it does, because it’s a pretty slick movie. It’s not burdened by an overabundance of intelligence, but it won’t make you feel as lousy as ‘The A-Team‘ (which, incidentally, came in at #5). The rest of the box office was pretty much the same as last week. ‘The Karate Kid‘ continued its uncanny winning streak at the box office. It came in at #4 and added another $15.4 million to its haul, which now clocks in at over $135 million. ‘Get Him to the Greek,’ ‘Prince of Persia: The Sands of Time,’ and ‘Shrek Forever After‘ maintained their modest momentum. This small crop of films, the “Middle of the Top 10” pack, will undoubtedly be seen as sleeper hits, with only one breakout (‘Shrek’) and not all that much staying power – especially when the next crop of films opens up towards the middle of the summer. Now a confession: I saw ‘Killers.’ Okay. I just had to get that off my chest. It’s at #9 this week. That is all. Oh! And ‘Jonah Hex!’ The scarred bounty hunter HUNG TOUGH in the Top 10. The movie opened last week at #8, we have to remember. It clung to life with another paltry $1.3 million this weekend, and out-earned ‘Iron Man 2,’ which quietly slipped out of the top 10 to land at #11. Can you imagine? Things should get more interesting this Friday, with two huge-ish releases – ‘The Last Airbender’ from Paramount and, of course, ‘The Twilight Saga: Eclipse’ from Summit. ‘Eclipse,’ the third chapter in the ‘Twilight‘ juggernaut, is an almost surefire blockbuster. And this one actually looks kind of interesting. ‘The Last Airbender’ is a huge question mark. It’s M. Night Shyamalan’s first attempt at a big budget franchise picture, based on an animated series that aired on Nickelodeon. The budget is well over $200 million with marketing costs. The director’s last two movies (‘Lady in the Water‘ and ‘The Happening‘) were huge financial disasters. And I haven’t heard a peep about this movie, aside from some journalists who visited effects house Industrial Light & Magic and said that the visual effects looked neat. “Neat,” huh? Oh, and it’s coming out in 3-D. Not that it was filmed that way. Nope. It was converted after the fact a la ‘Clash of the Titans.’ We all know how well that worked out. This could either be a runaway hit or a catastrophic disaster.